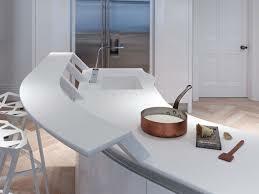 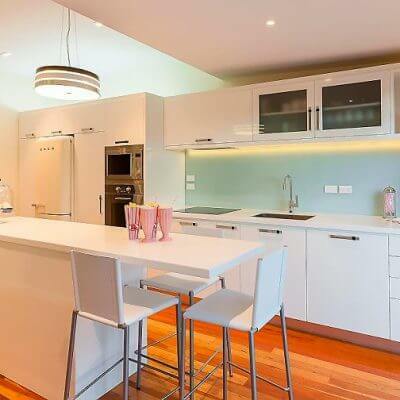 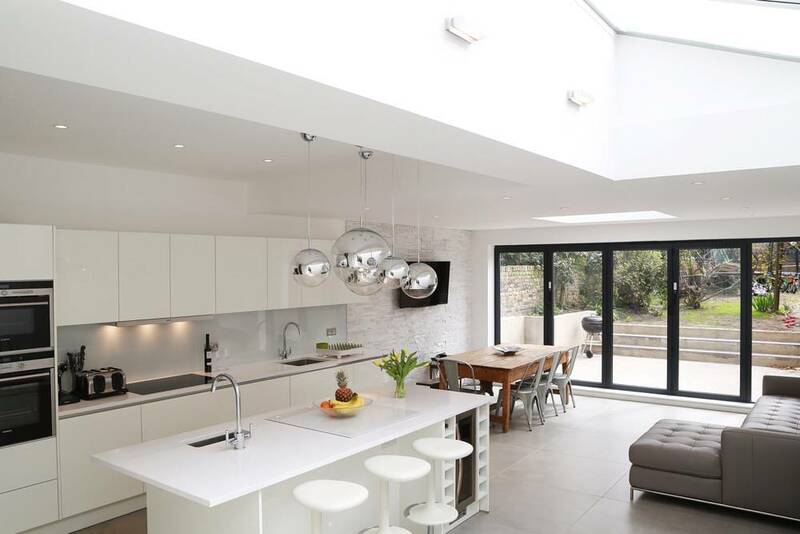 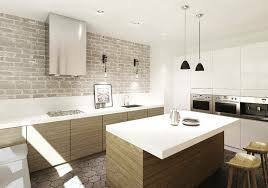 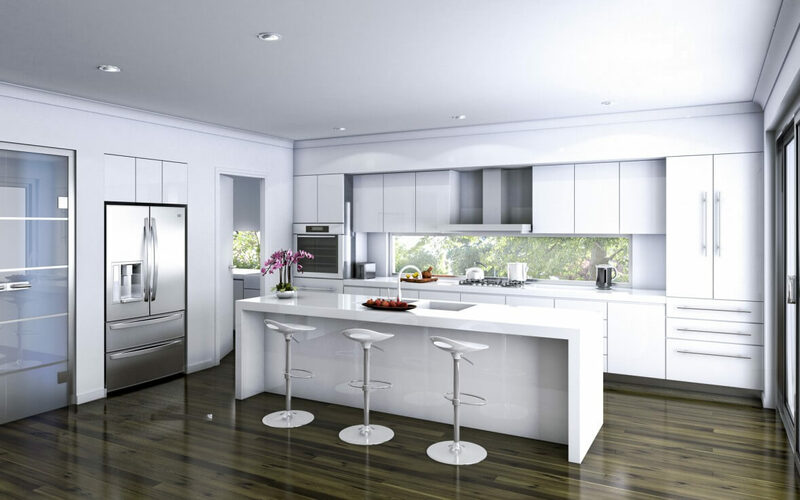 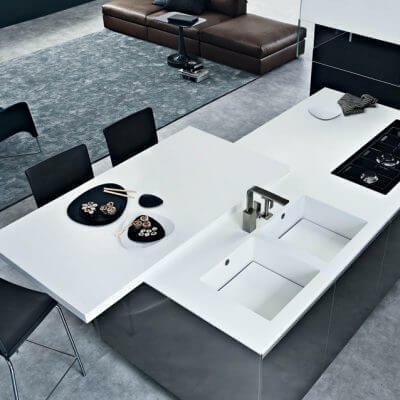 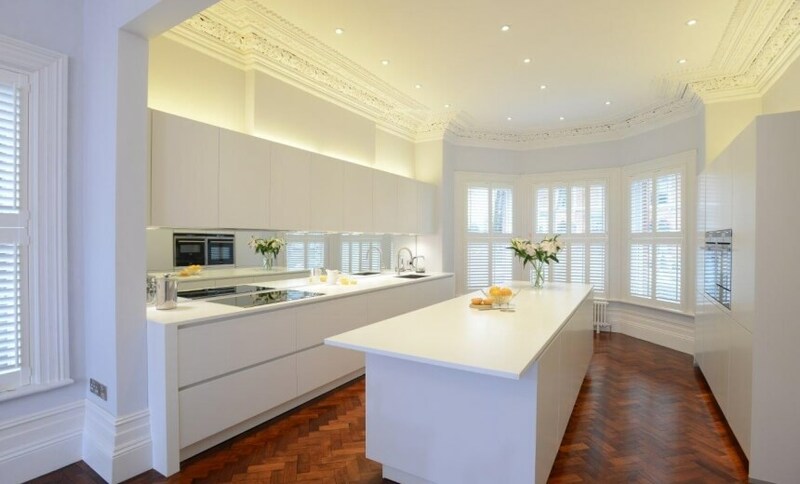 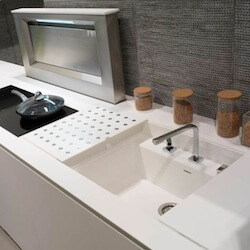 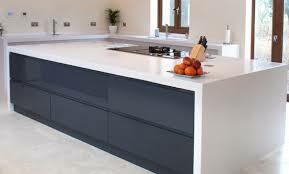 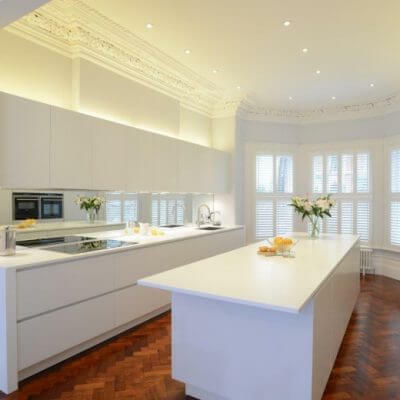 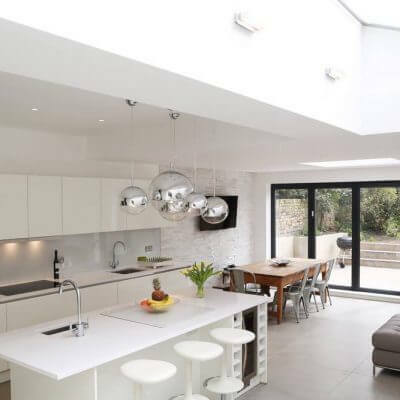 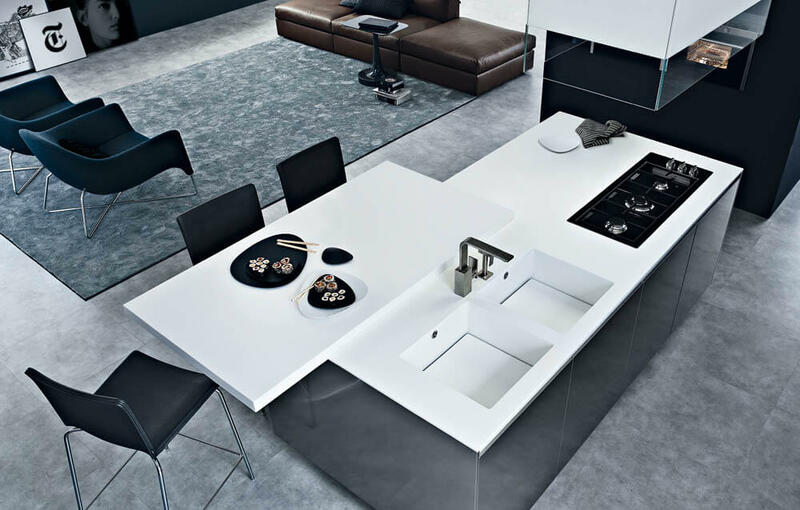 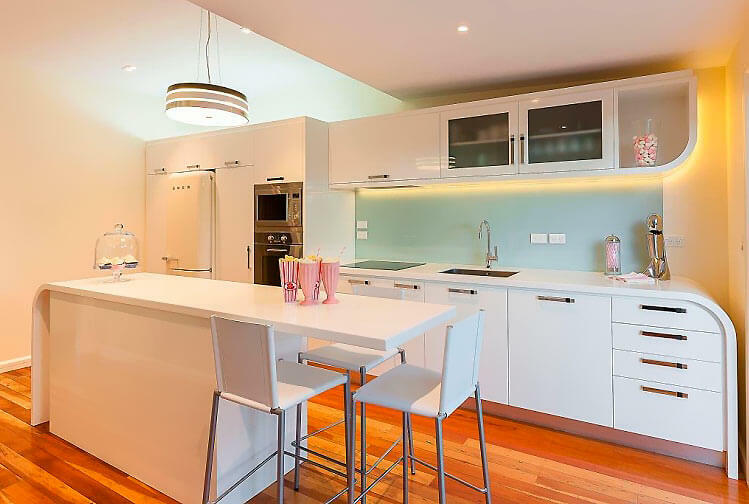 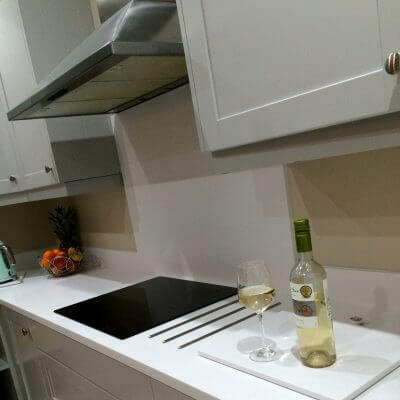 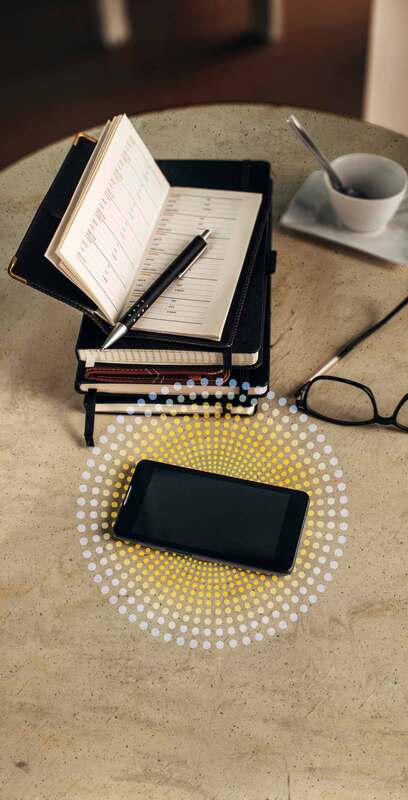 Architects and kitchen designers worldwide have discovered that the DuPont™ Corian® high-tech surface was created to offer a higher performance alternative to conventional surfacing materials; it is now internationally recognised for its value to the world of design and architecture. 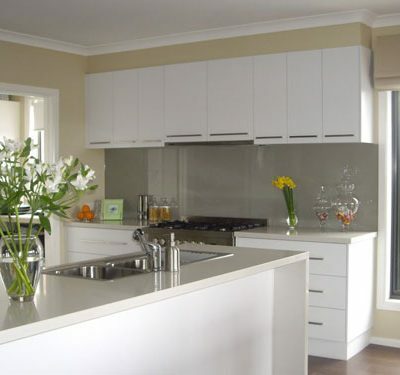 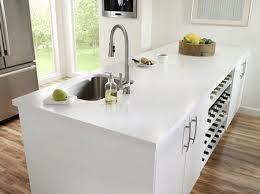 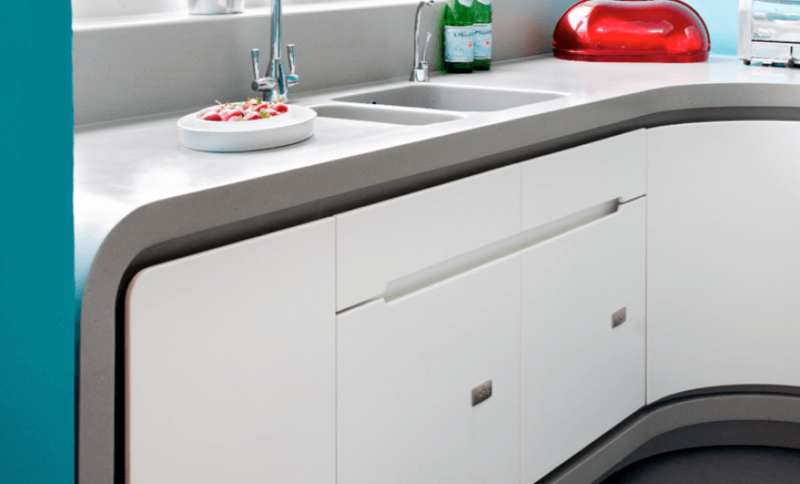 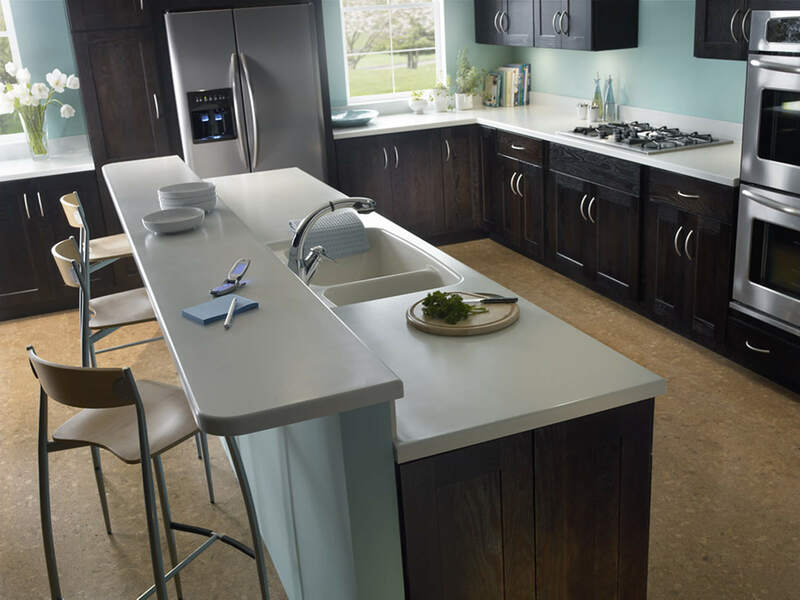 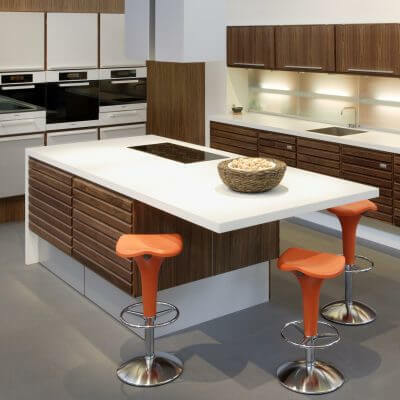 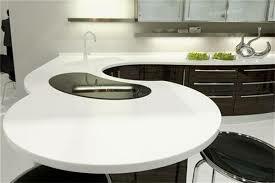 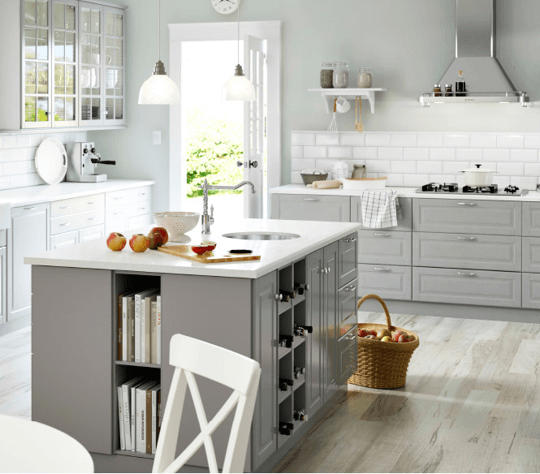 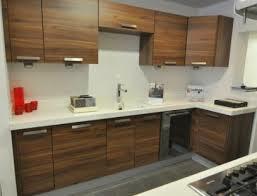 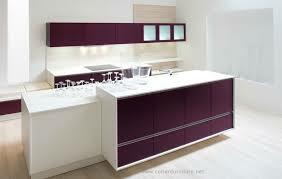 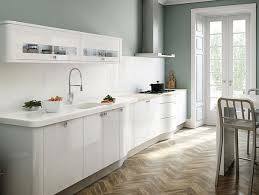 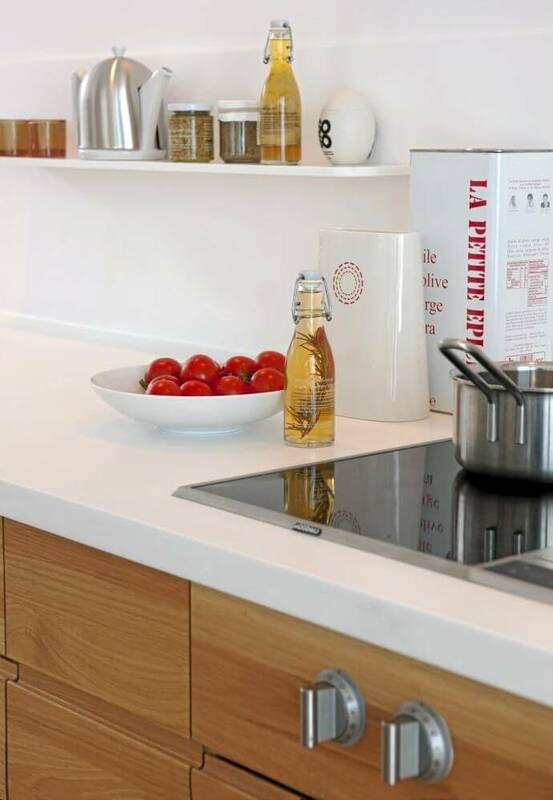 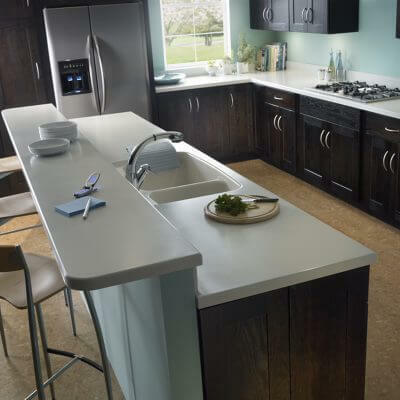 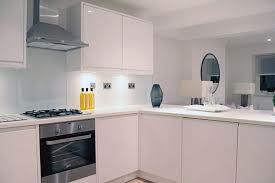 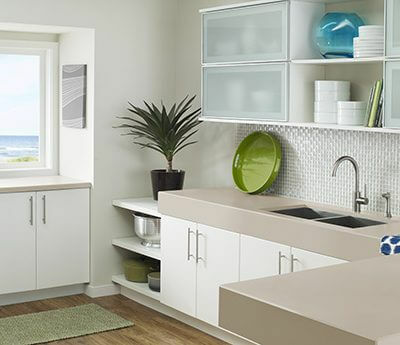 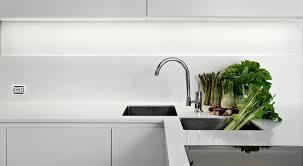 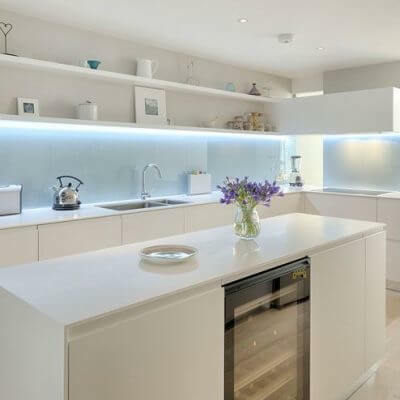 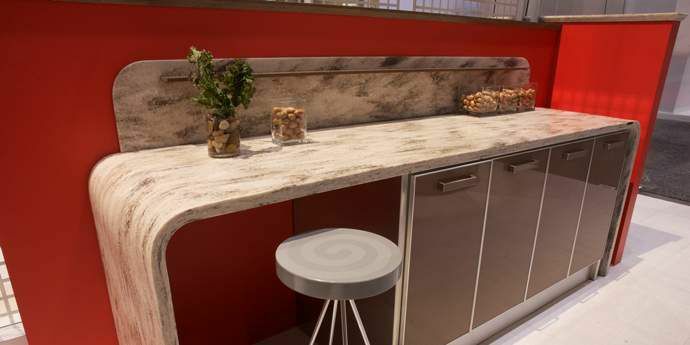 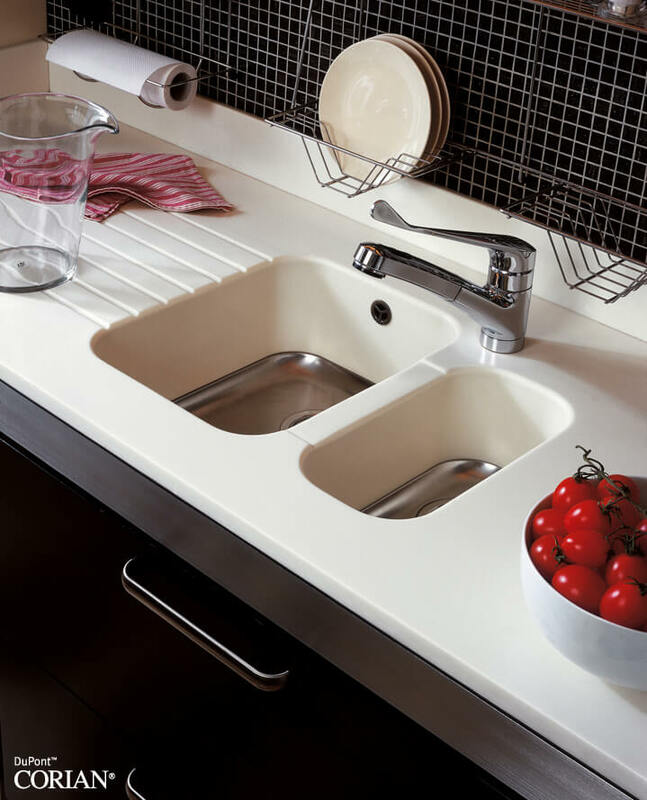 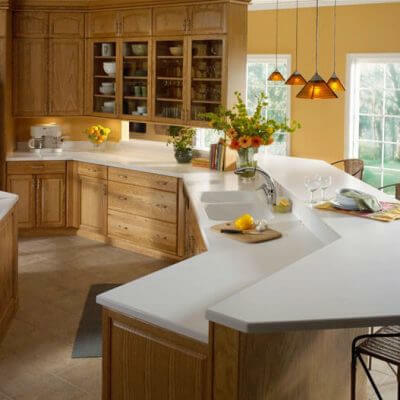 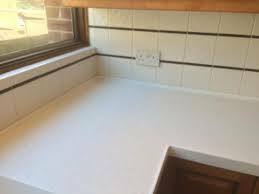 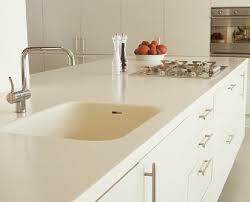 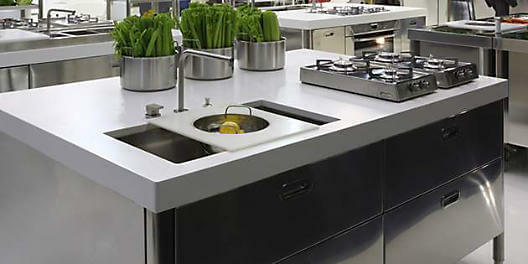 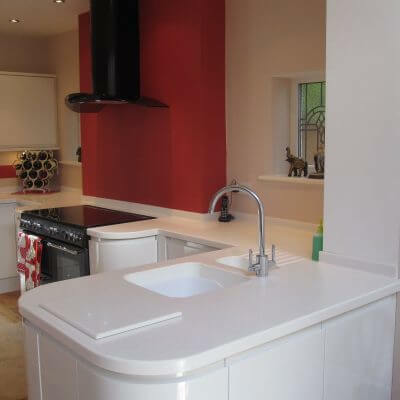 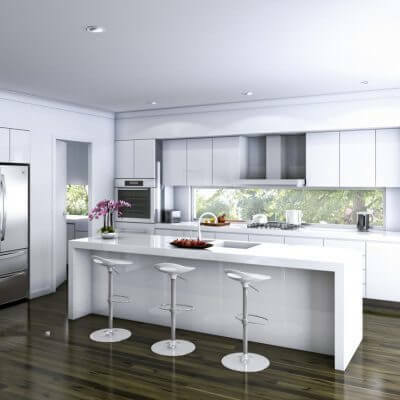 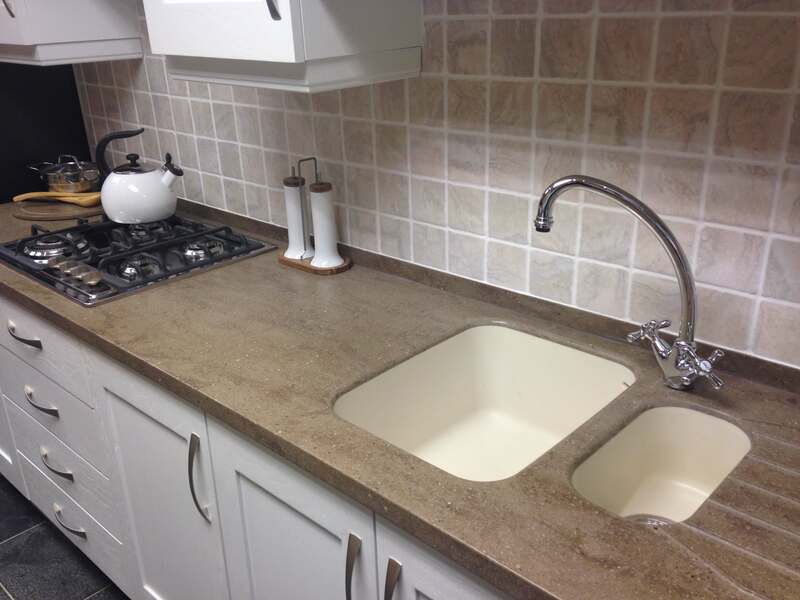 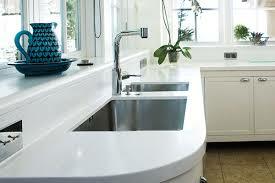 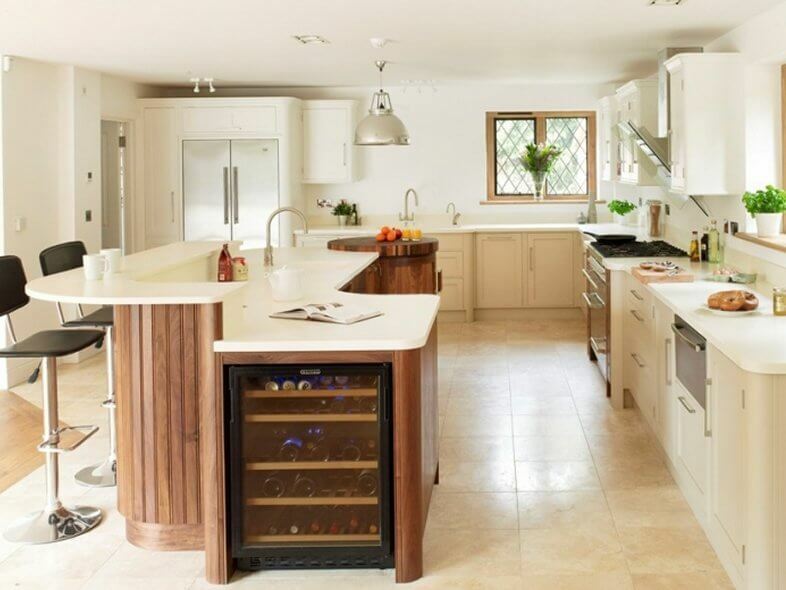 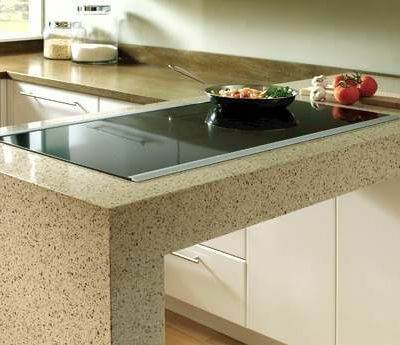 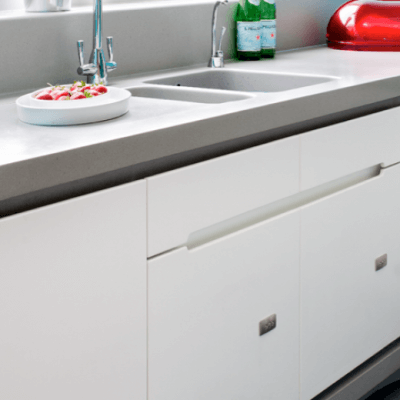 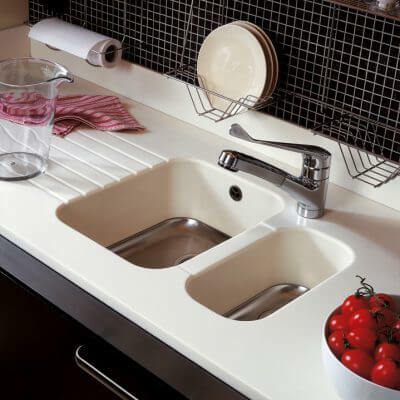 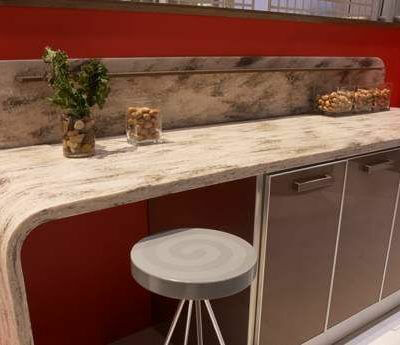 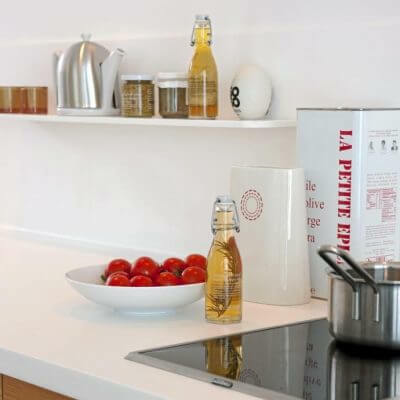 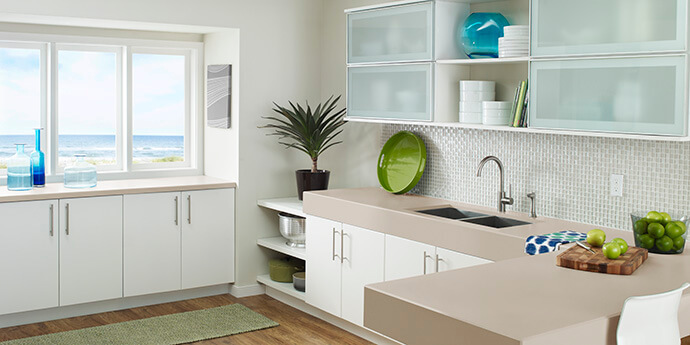 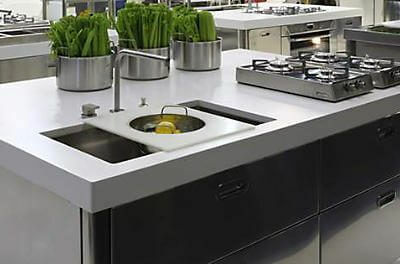 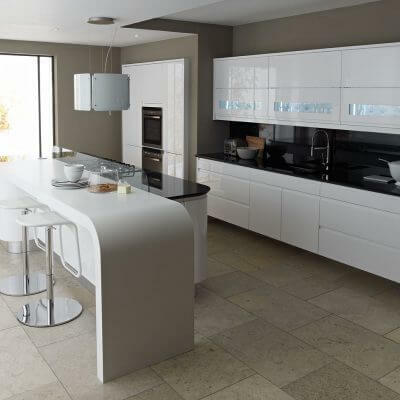 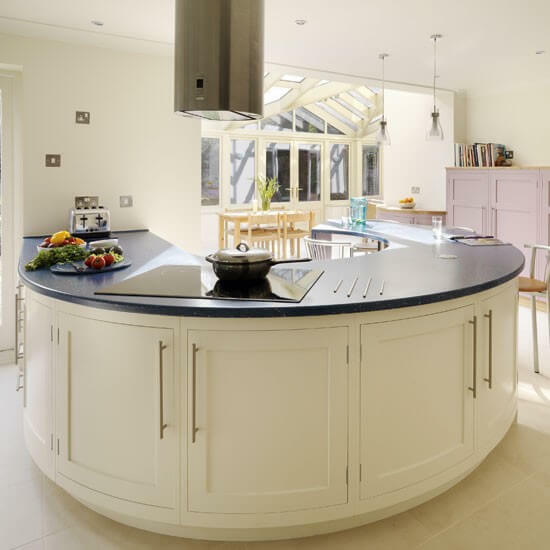 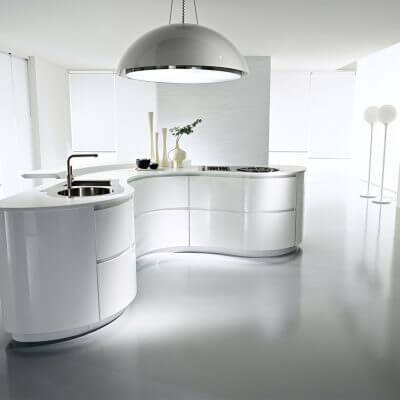 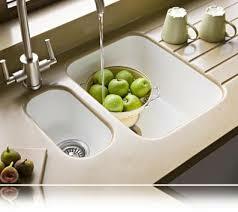 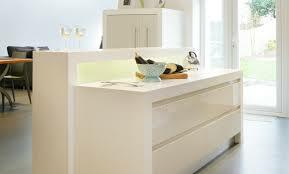 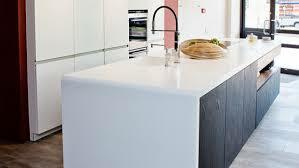 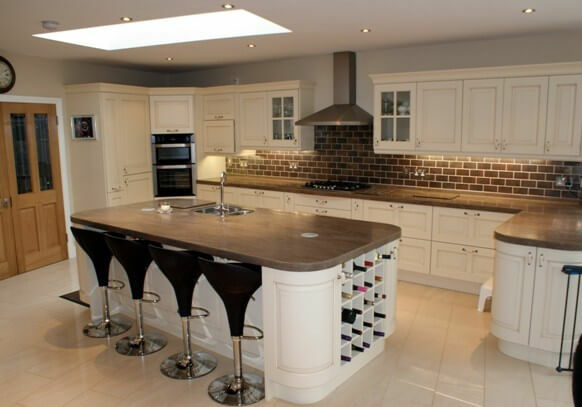 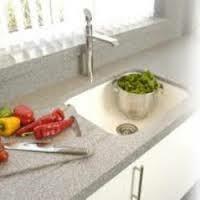 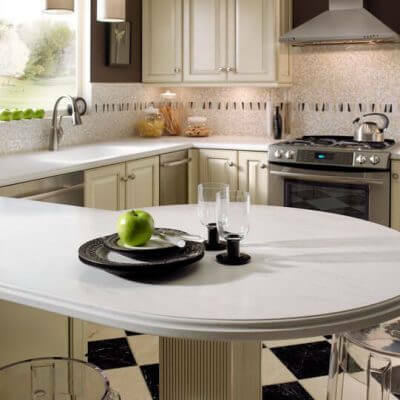 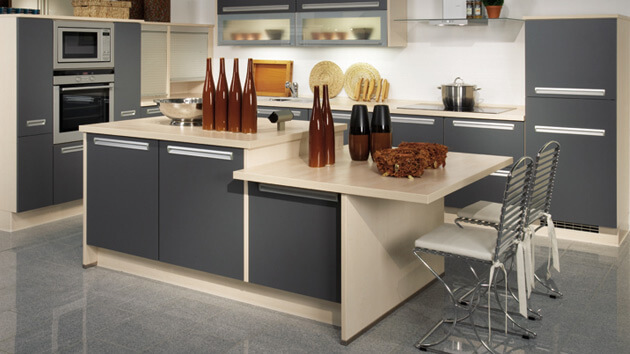 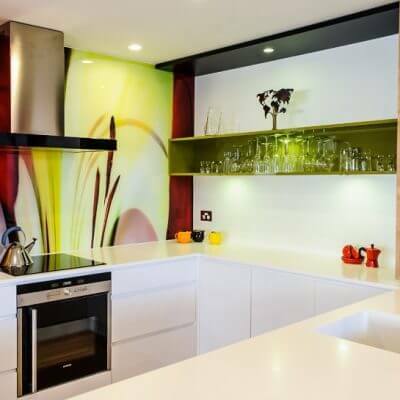 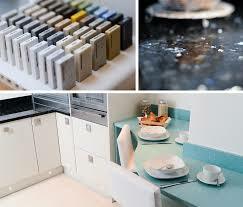 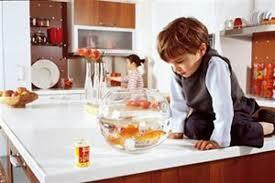 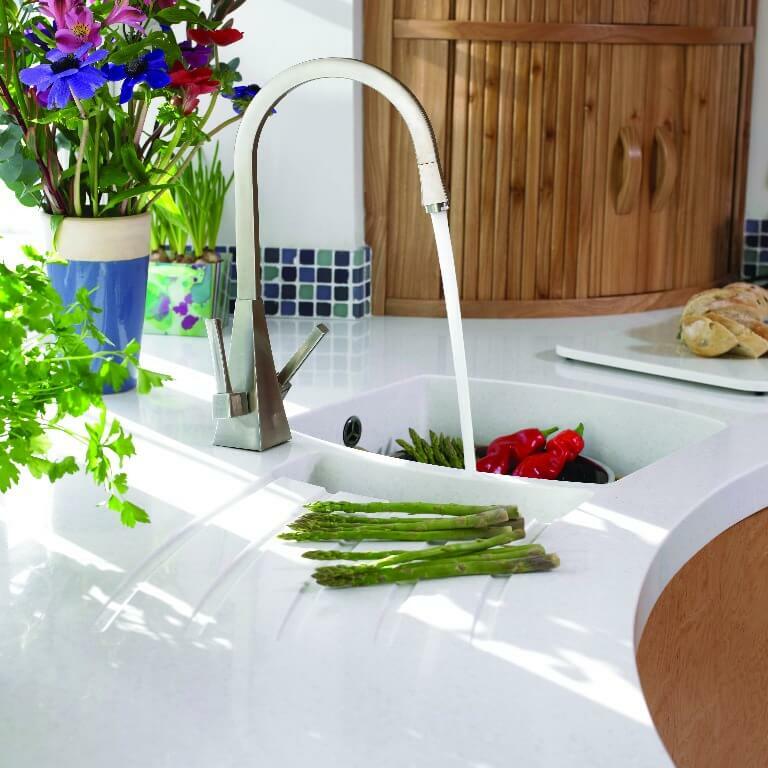 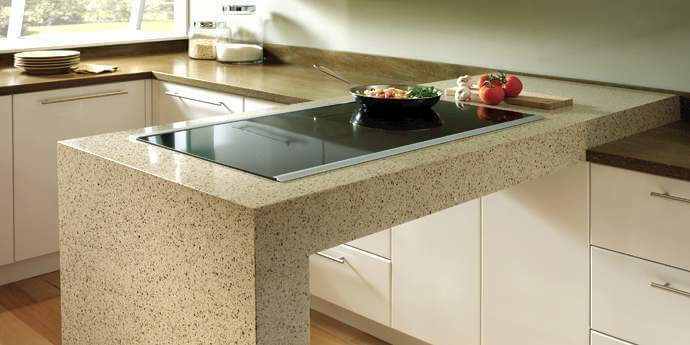 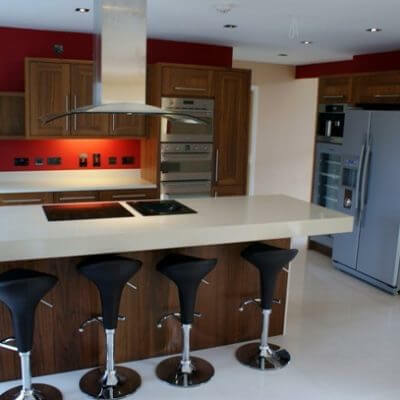 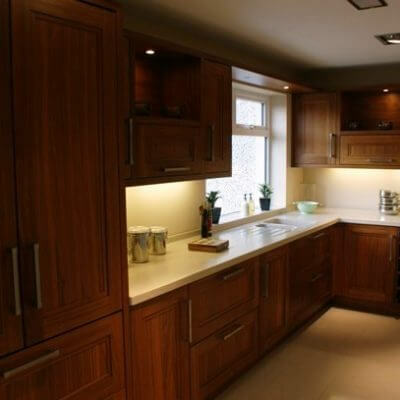 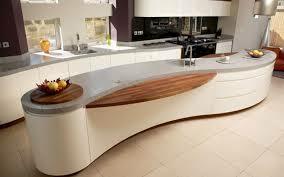 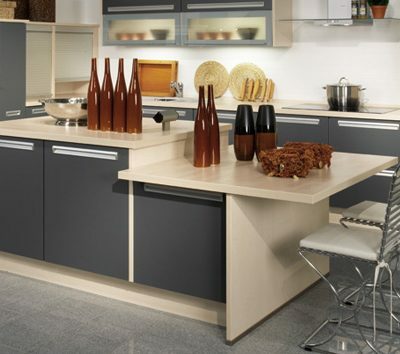 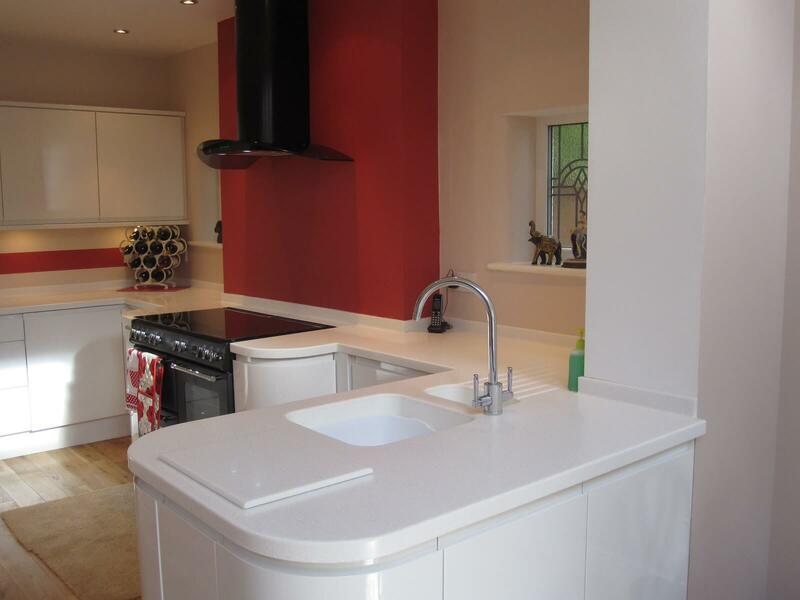 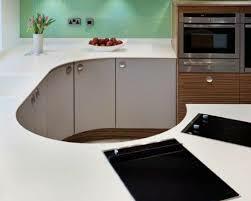 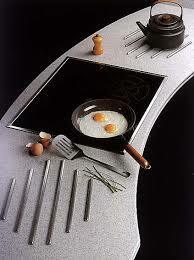 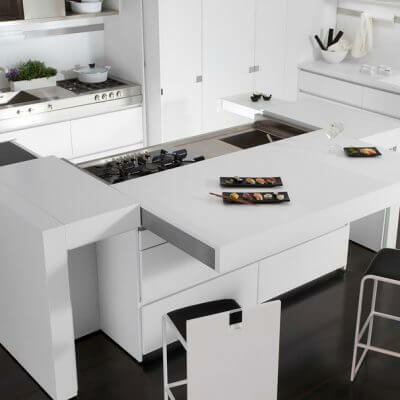 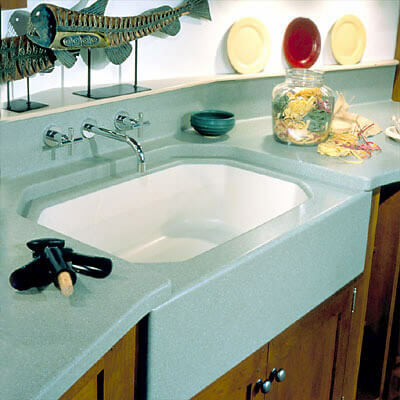 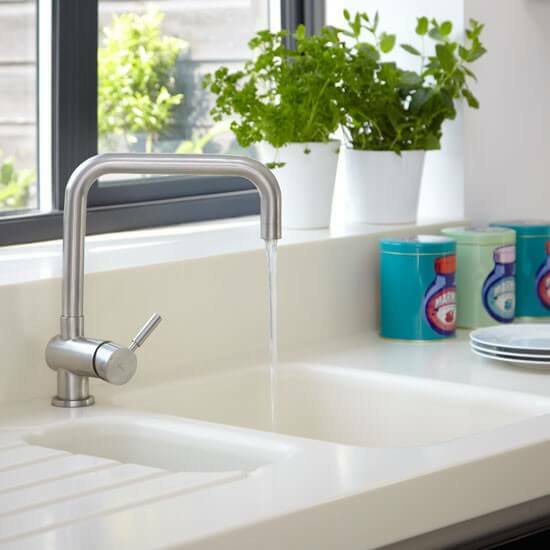 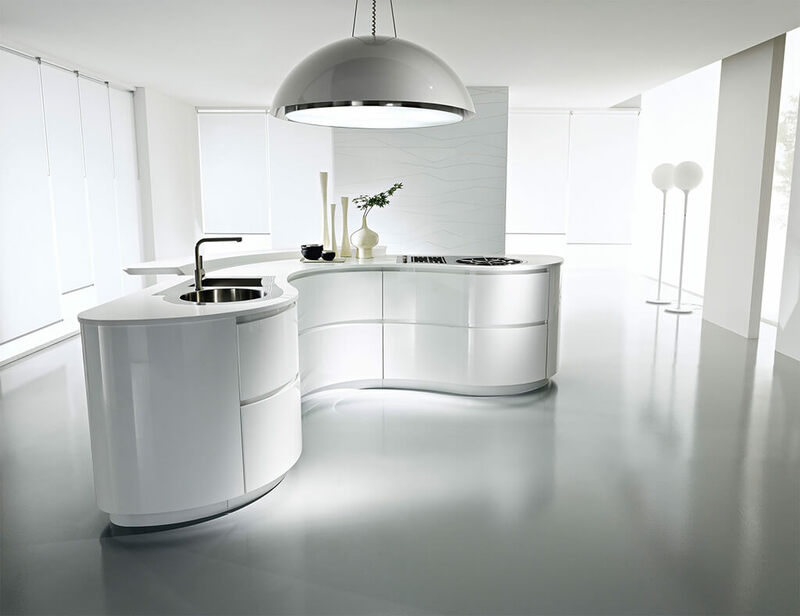 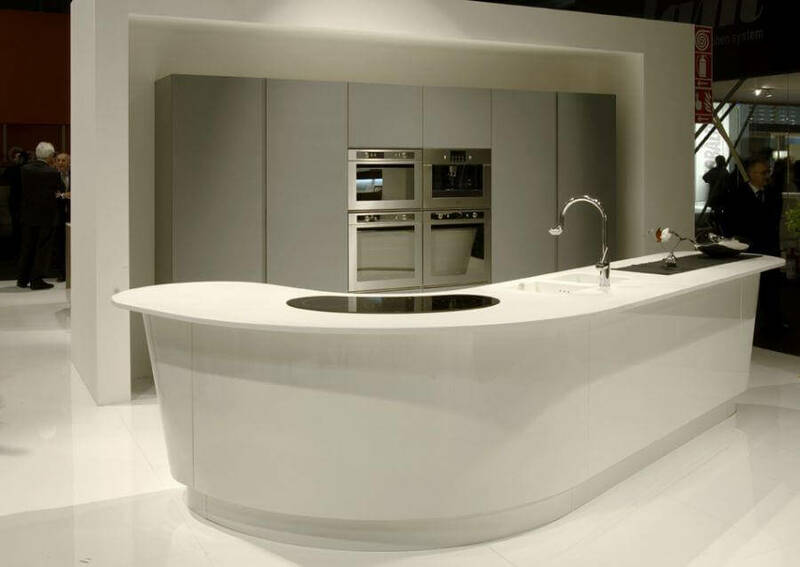 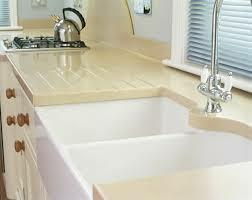 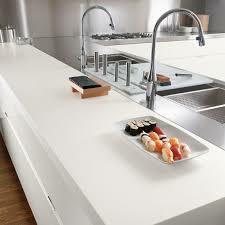 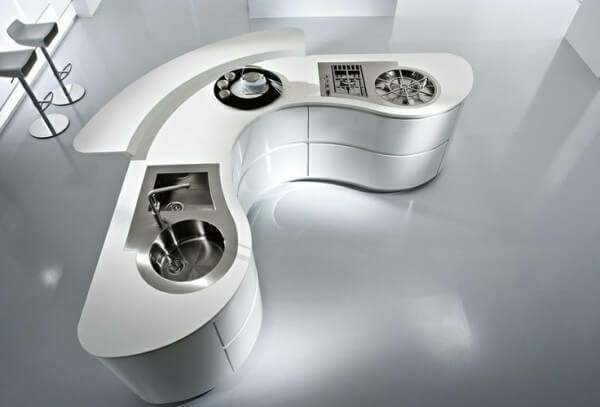 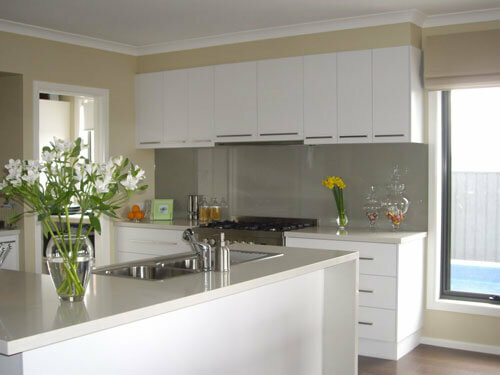 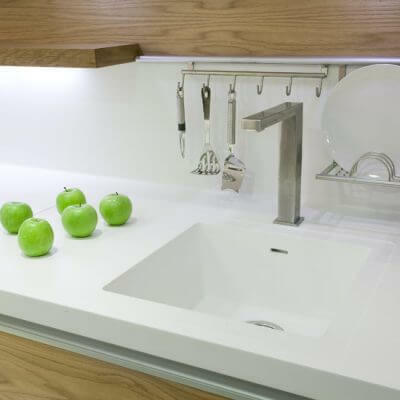 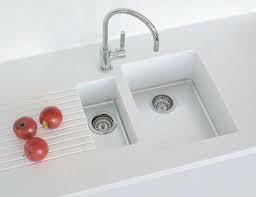 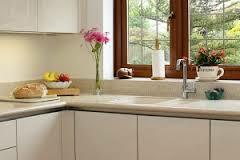 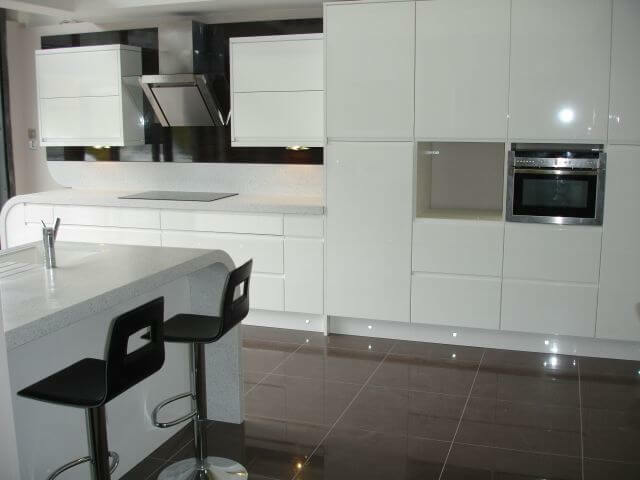 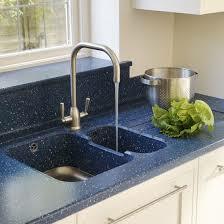 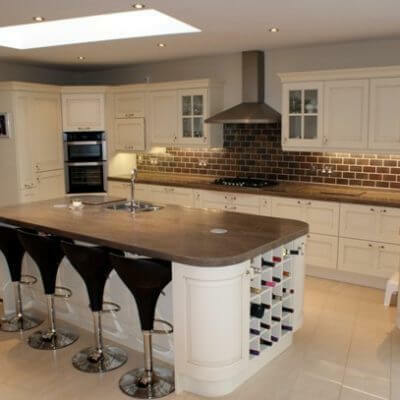 DuPont™ Corian® is ideal for the kitchen because it is hygienic, durable, and elegant and has a wide range of colours. 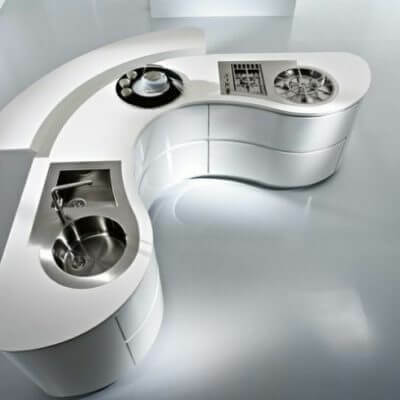 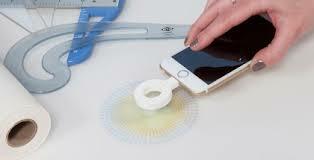 It can be formed into three dimensional shapes by means of a process called thermoforming. 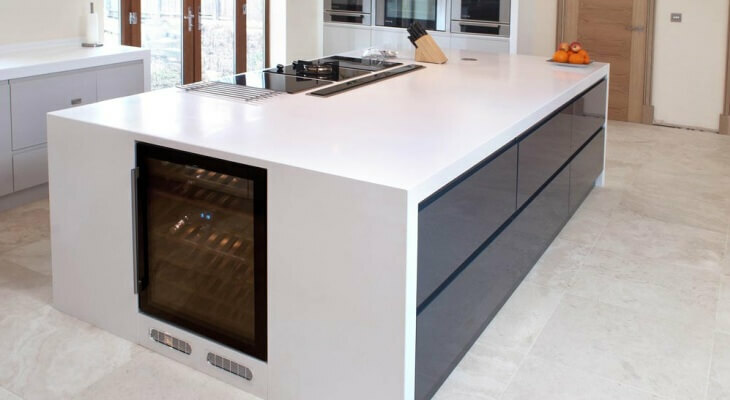 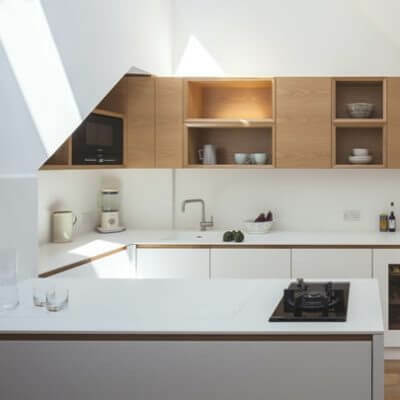 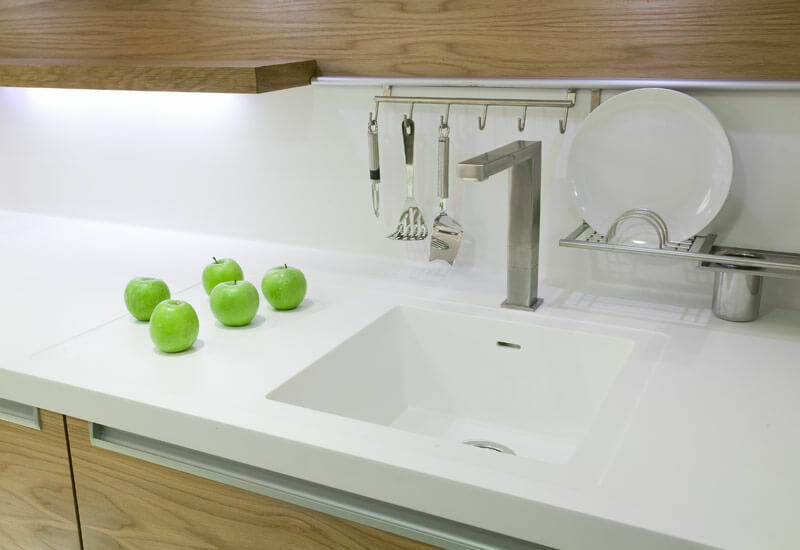 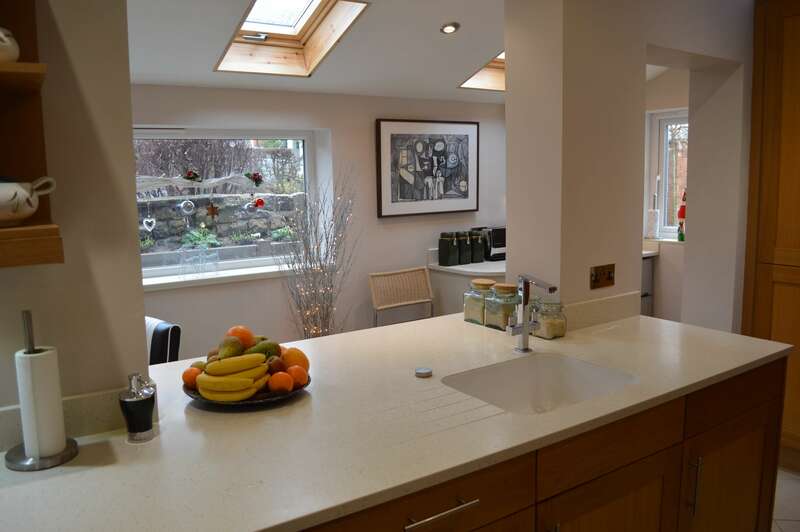 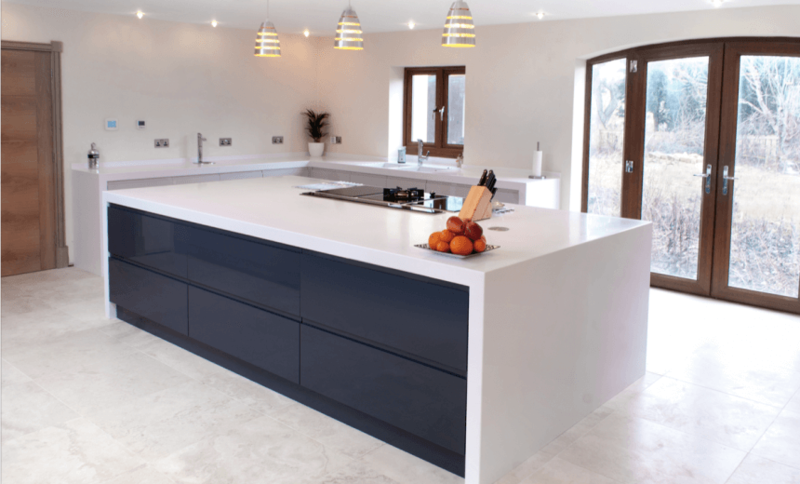 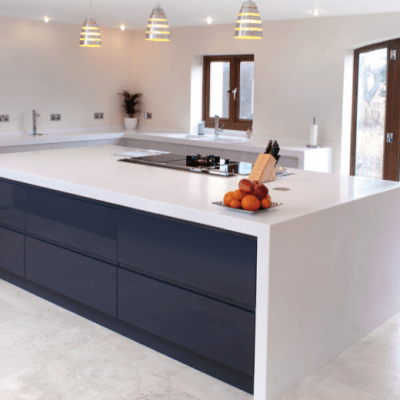 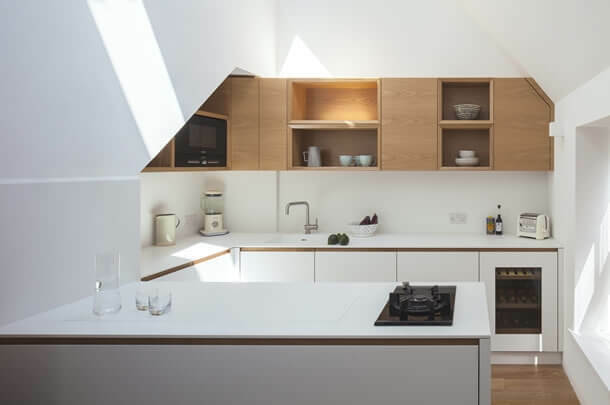 Corian® can be joined, by trained fabricators, to provide seamless worktop surfaces, integrated upstands, wall panelling and integrated Corian® sinks. 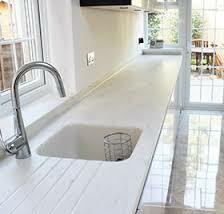 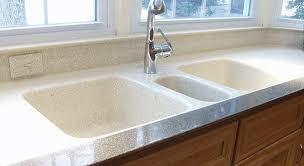 All with no gaps or grouting thereby eliminating places for water to collect or bacteria to grow. 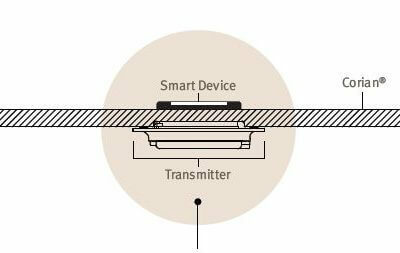 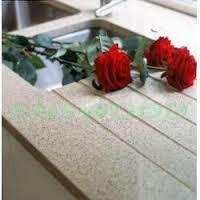 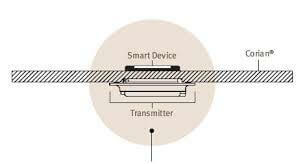 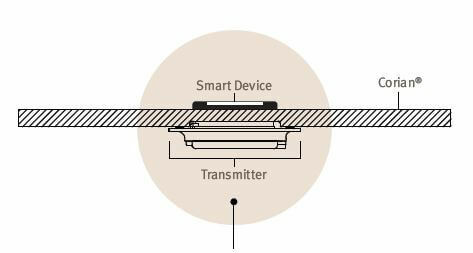 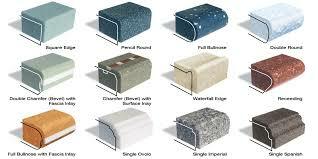 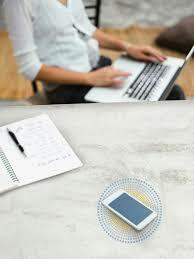 To see the variety of edge profiles and upstands available, please use this link. 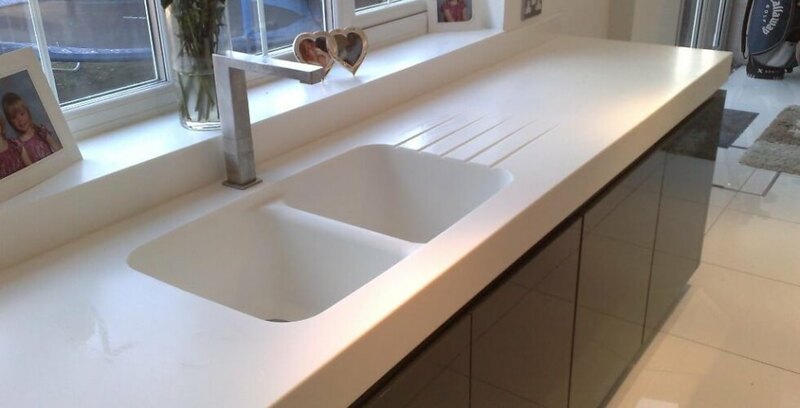 Corian® is also the ideal material for the bathroom because you can create striking design schemes in the colours of your choice for vanity units with integral vanity bowls, shower trays and shower walls, all with no unsightly joints or unhygienic grouting! 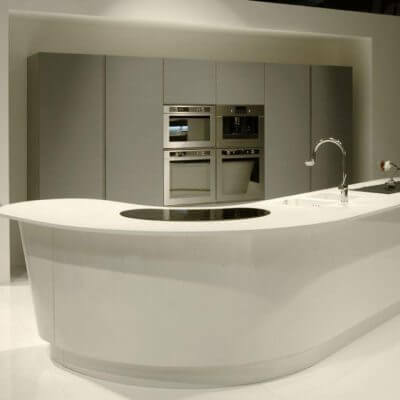 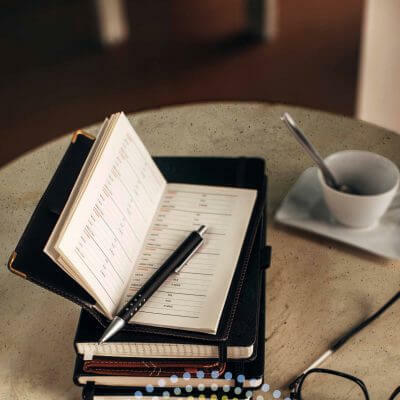 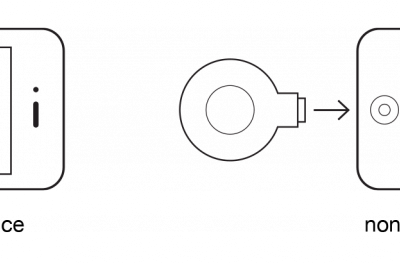 How to describe Corian®? 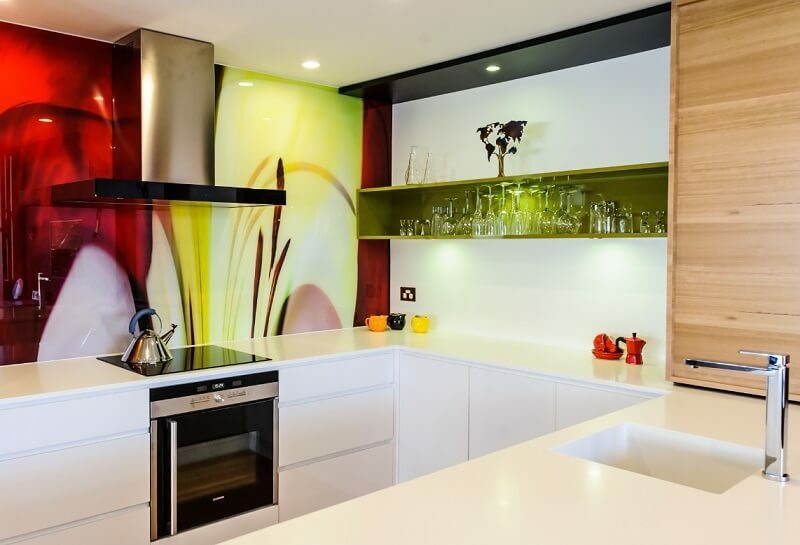 It's colourful, imaginative, versatile, stylish, and capable of being formed into virtually any shape or design! 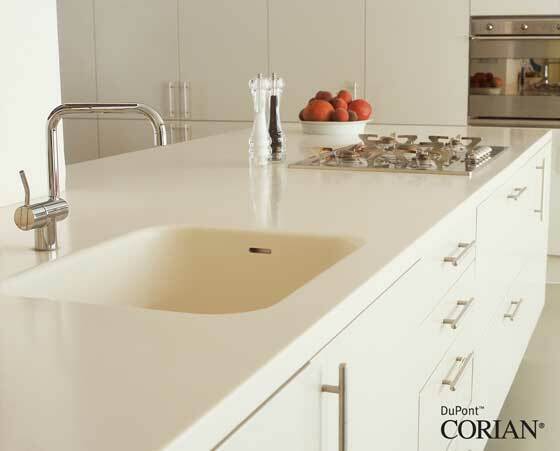 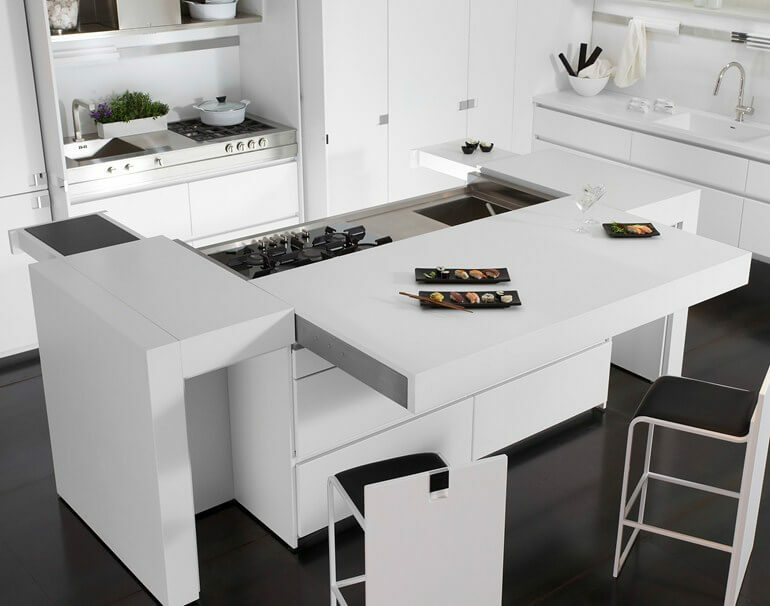 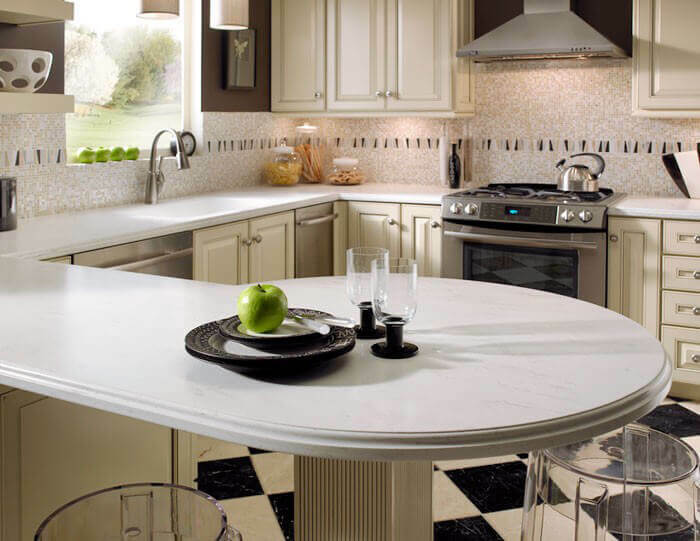 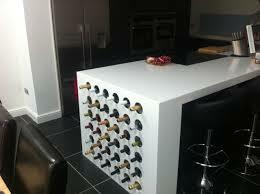 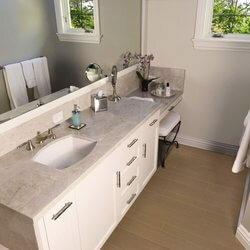 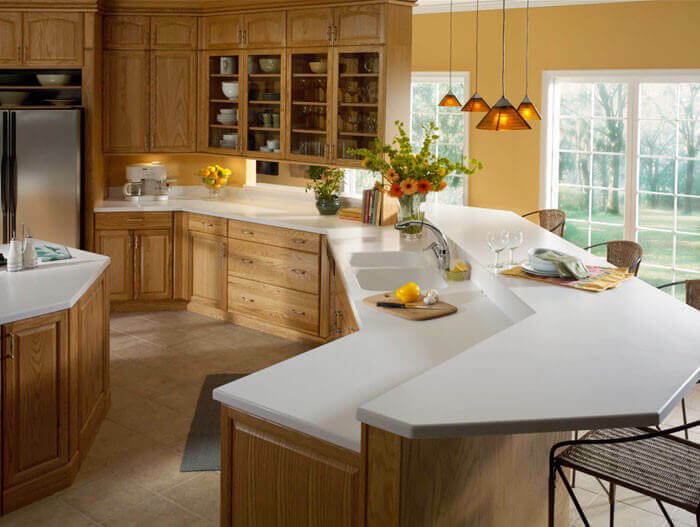 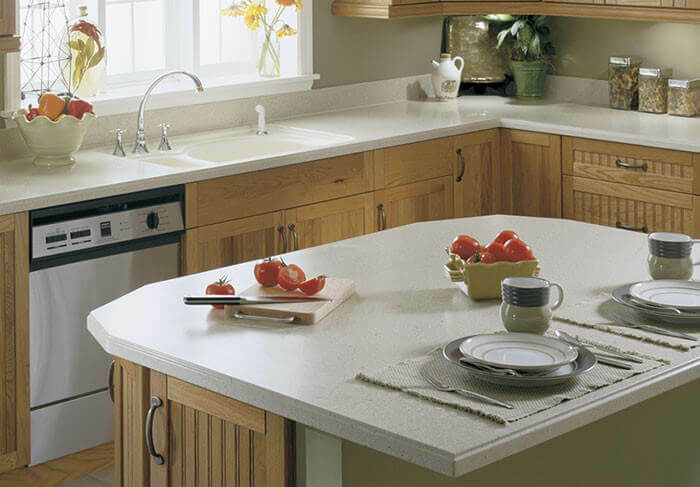 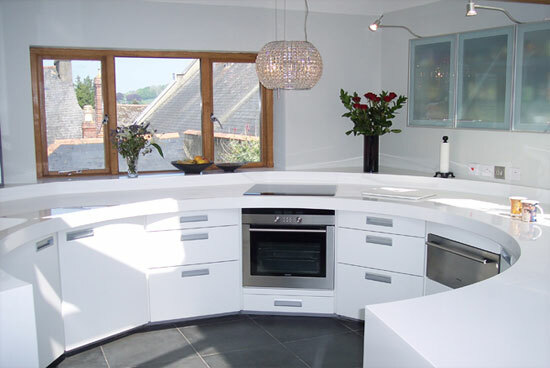 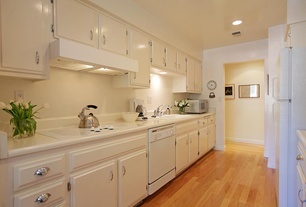 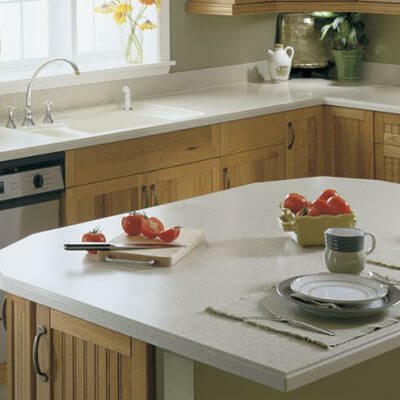 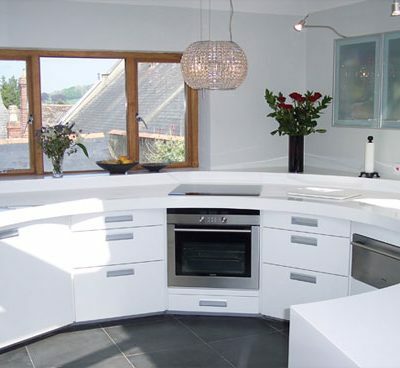 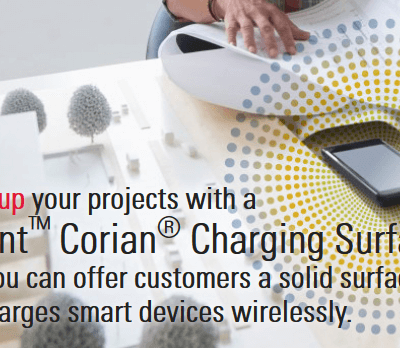 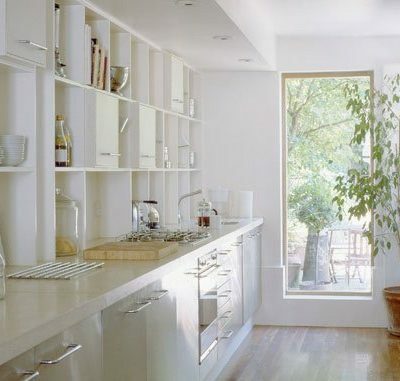 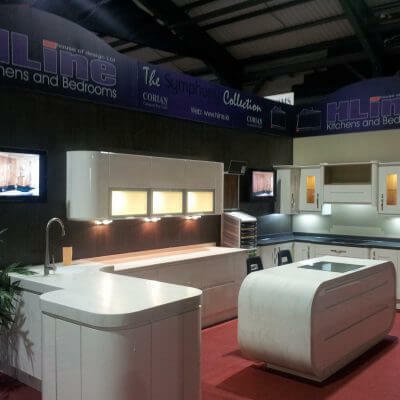 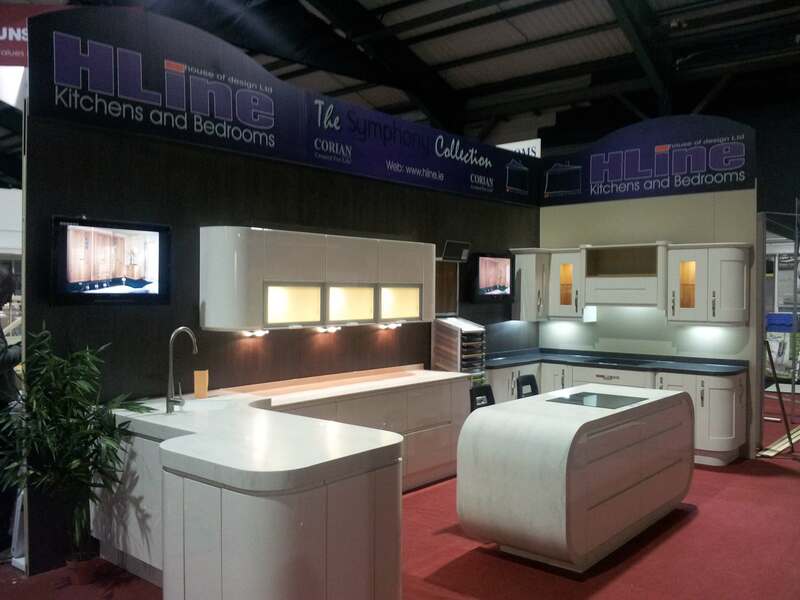 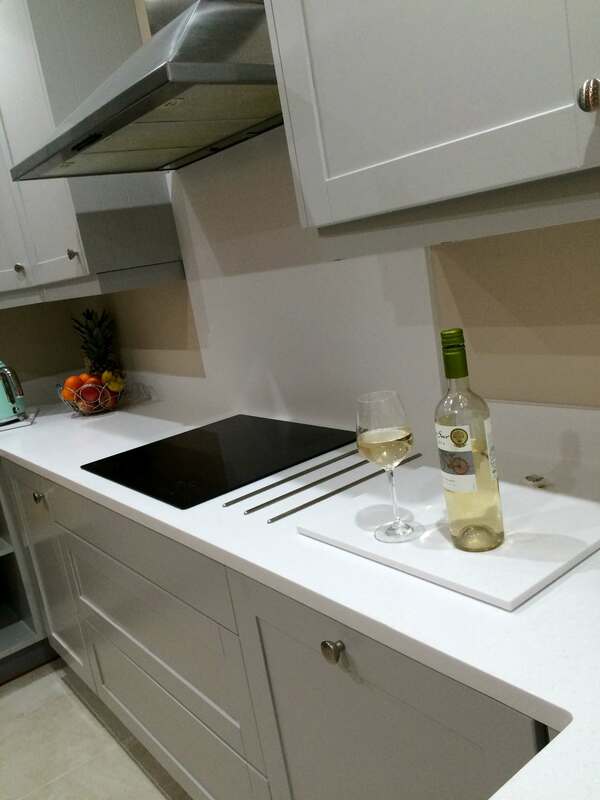 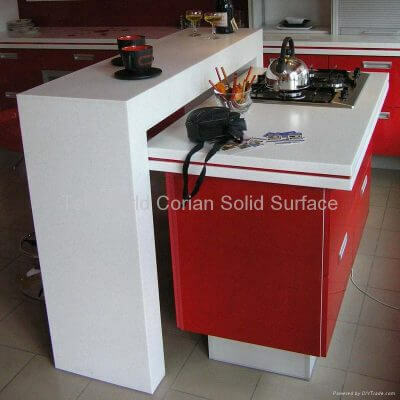 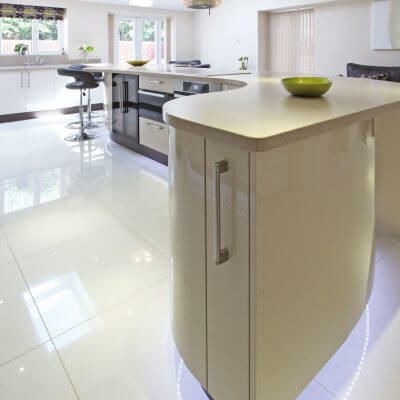 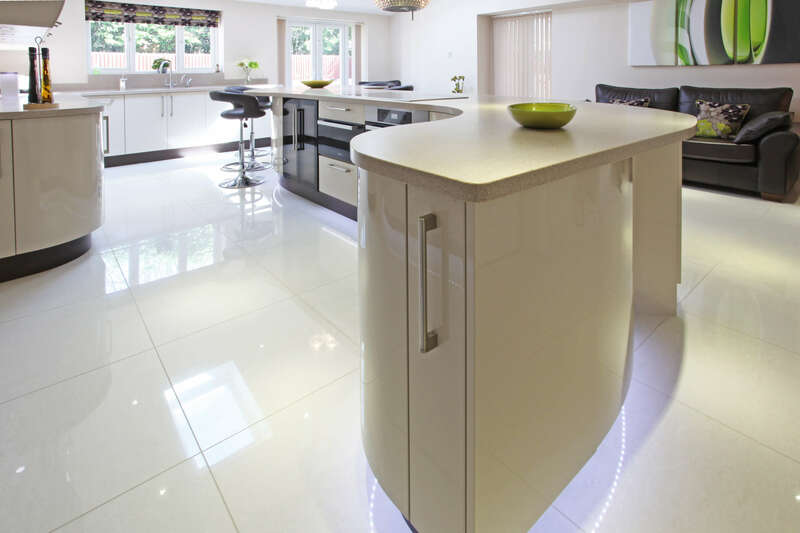 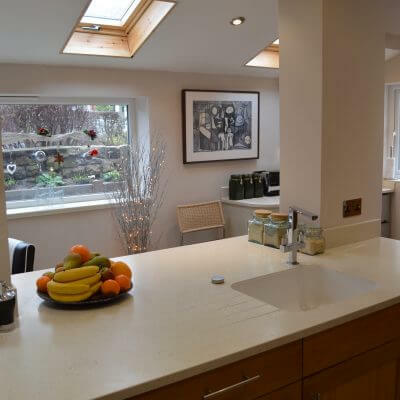 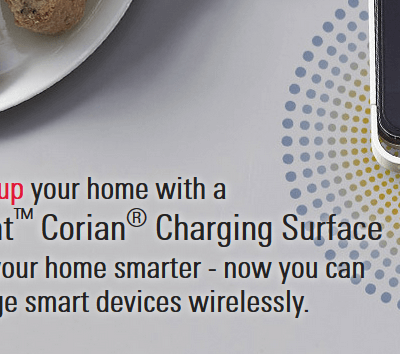 You'll love Corian®; it's a pleasure to live with! 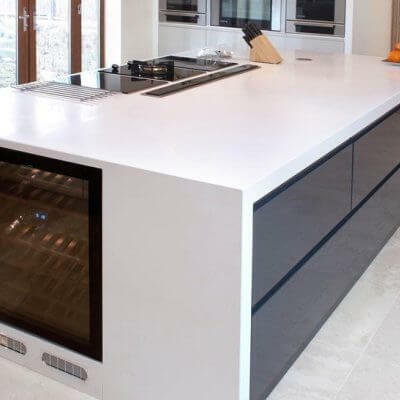 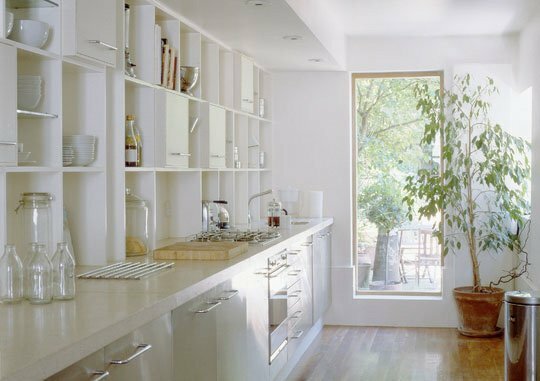 OBRE offer a complete fabrication and installation service to architects, designers, contractors, kitchen companies, and residential clients. 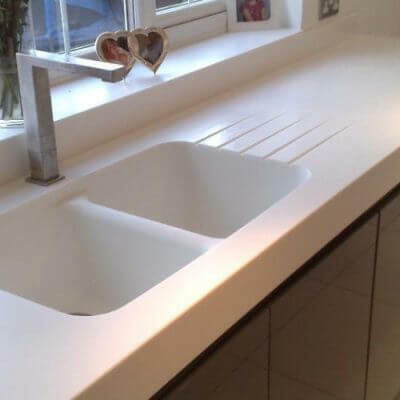 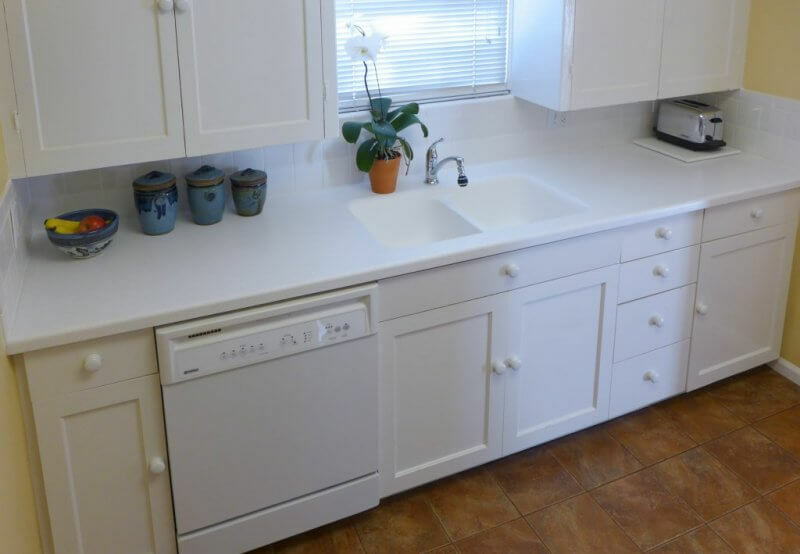 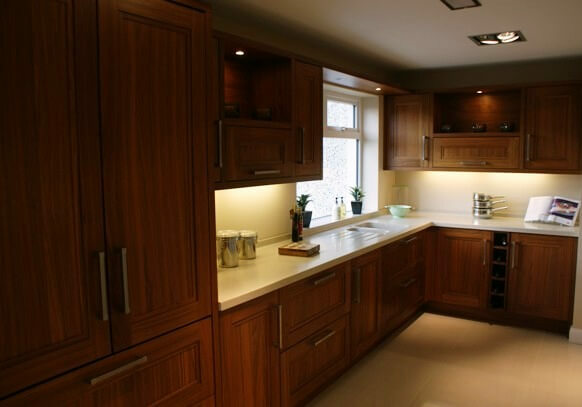 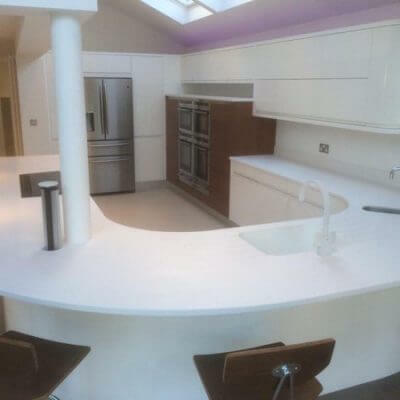 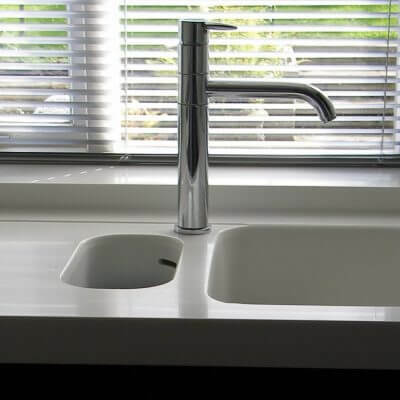 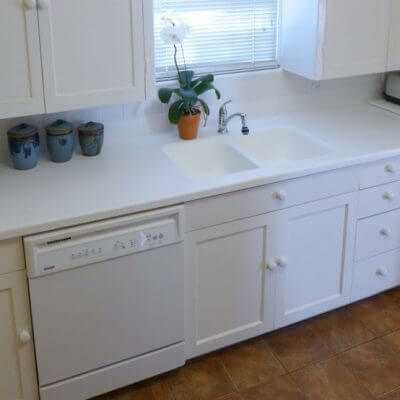 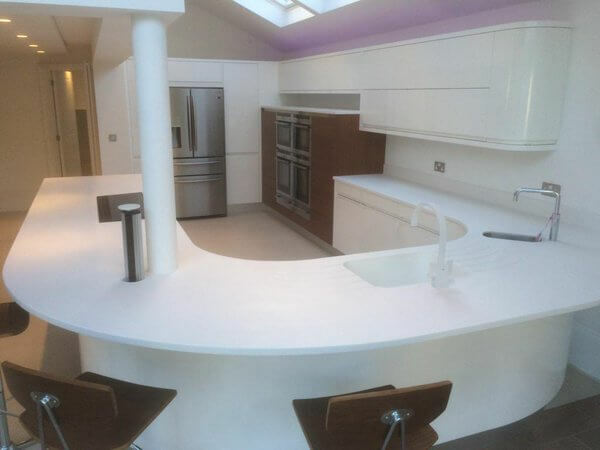 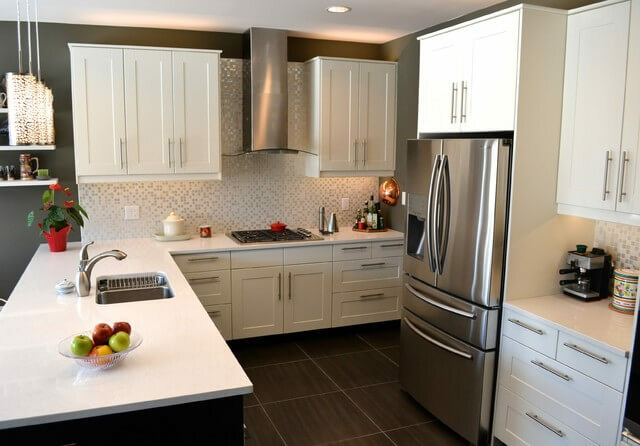 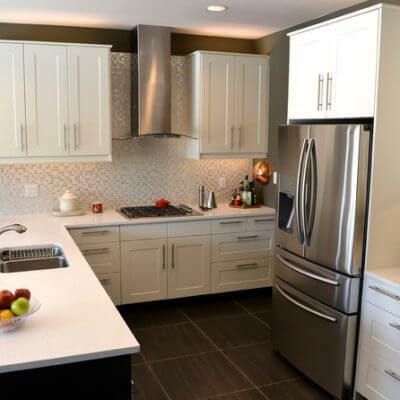 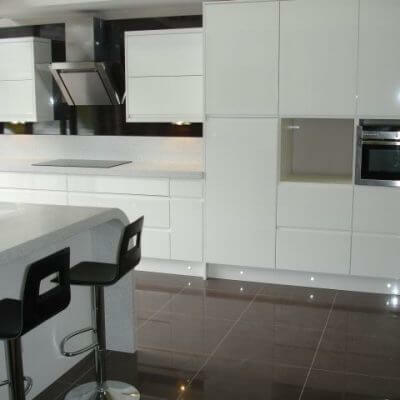 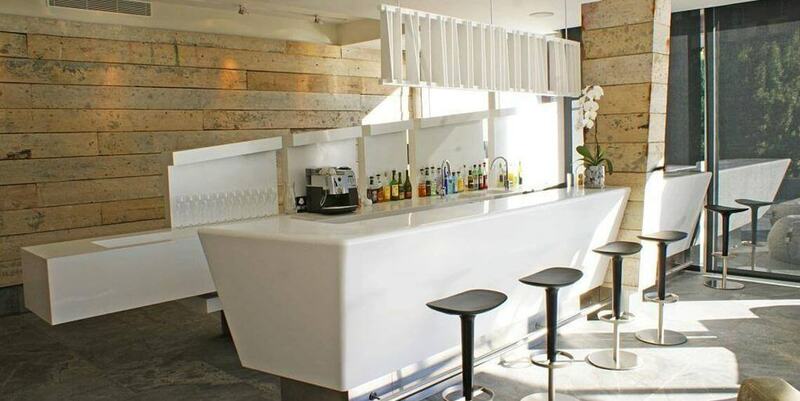 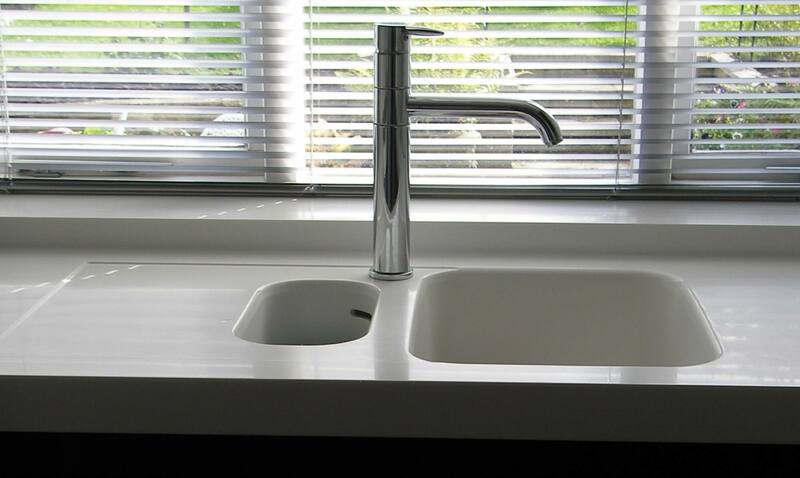 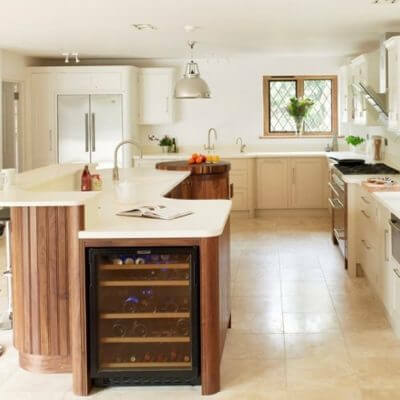 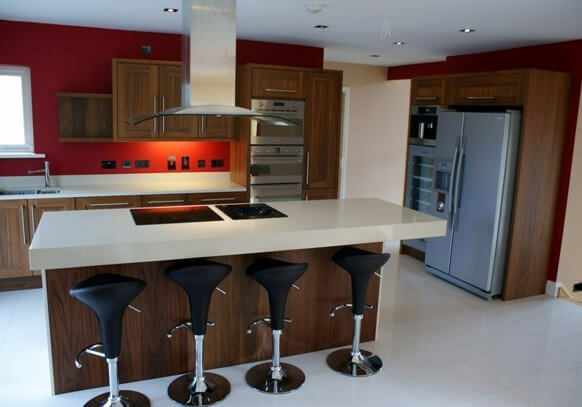 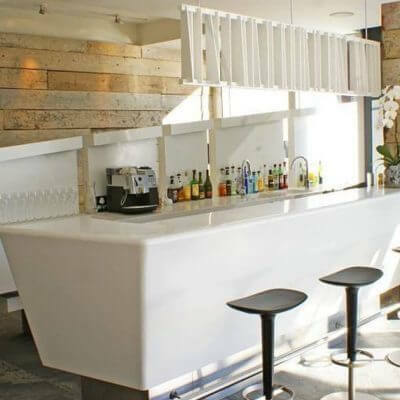 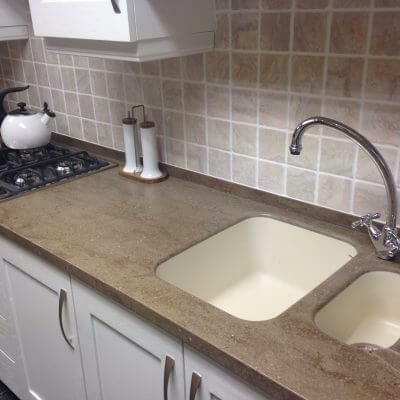 Our OBRE team of office personnel, fabricators, and site installers are very experienced in the particular skills required to fabricate, finish, and install Corian® to the highest standard. 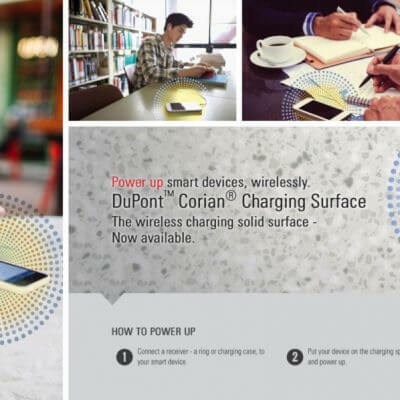 OBRE are full members of the DuPont™ Quality Network. 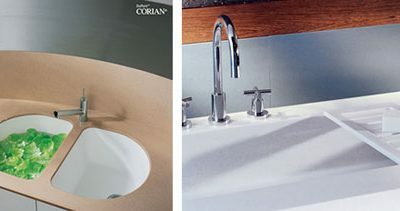 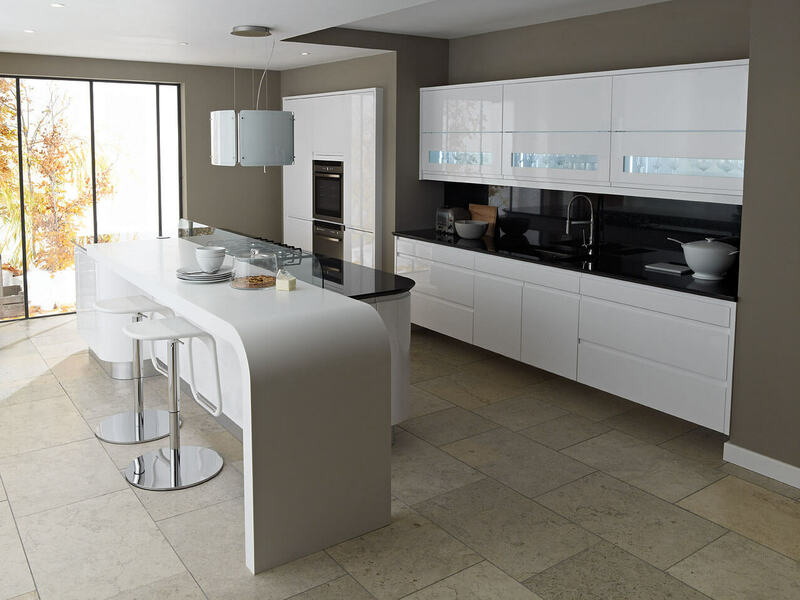 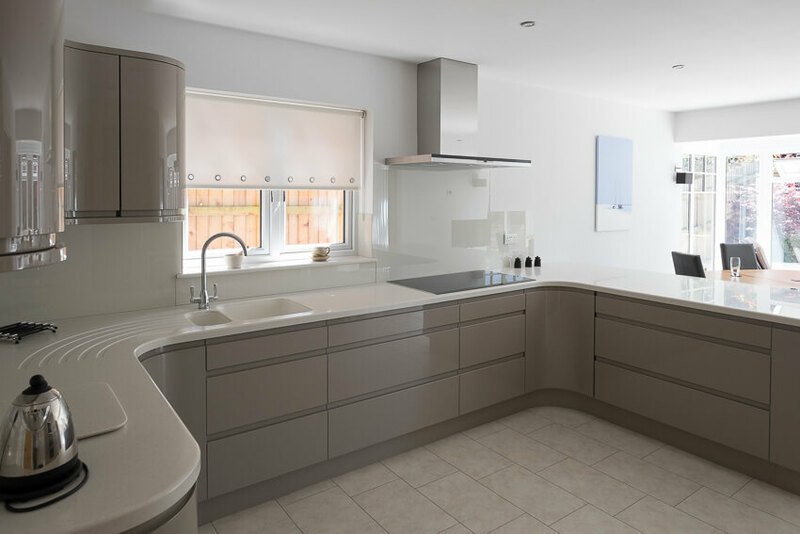 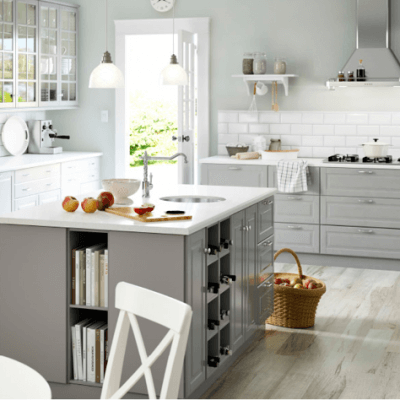 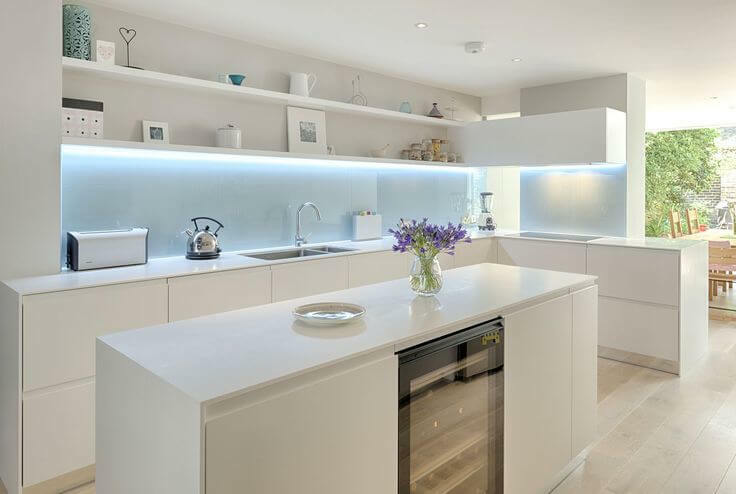 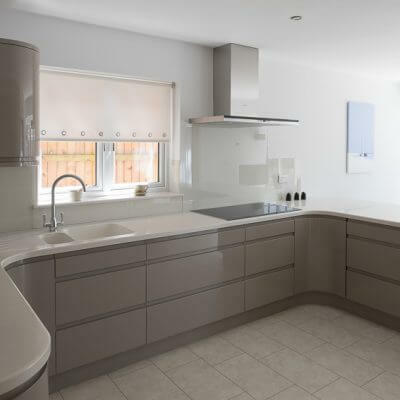 For more information about Corian® please use the links below to select the Corian® brochures relevant to your requirements and also view below the Corian® residential images gallery.